The memorial is spread over 40 acres and was built at the cost of Rs 176 crore. It is adjoining India Gate complex capital in the heart of the capital. 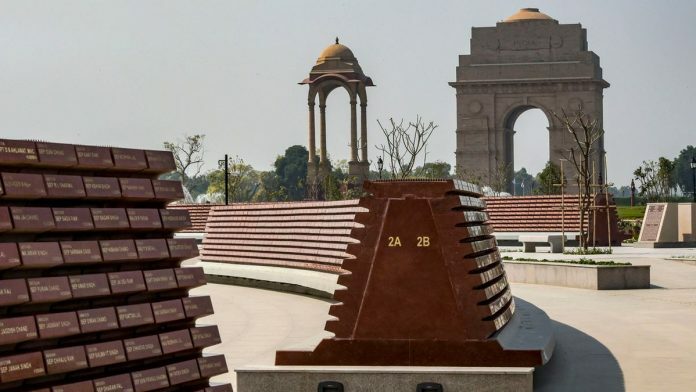 New Delhi: Prime Minister Narendra Modi on Monday inaugurated the country’s National War Memorial (NWM) adjoining the iconic India Gate complex in the heart of the capital, nearly 60 years after it was mooted to honour the fallen soldiers after Independence. Spread over an area of approximately 40 acres, the memorial comprises four concentric circles, namely– the ‘Amar Chakra, the Veerta Chakra, the ‘Tyag Chakra’ and the ‘Rakshak Chakra’ with names of 25,942 soldiers inscribed in golden letters on granite tablets. It also includes a central obelisk, an eternal flame and six bronze murals depicting famous battles fought by Indian Army, Air Force and Navy in a covered gallery (Veerta Chakra). The PM dedicated the memorial, built at a cost of Rs 176 crore, by lighting the flame positioned at the bottom of the stone-made obelisk. Rose petals were showered by IAF helicopters and a fly-past in ‘Missing Man’ formation was also part of the event. There was no national memorial to commemorate the sacrifice of fallen soldiers after independence. The NWM pays tribute to soldiers who laid down their lives defending the nation during India-China war in 1962, Indo-Pak wars in 1947, 1965 and 1971, Indian Peace Keeping Force Operations in Srilanka and in the Kargil conflict of 1999. In the complex, 16 walls have been constructed in the Tyag Chakra for paying homage to the 25,942 battle casualties and their names have been inscribed on granite tablets arranged in a circular pattern, symbolizing the ancient Indian war formation ‘Chakravyuh’. The outermost circle — the Rakshak Chakra comprises of rows of more than 600 trees with each tree representing many soldiers who guard the territorial integrity of the nation round the clock. The memorial complex also comprises graphic panels and stone murals. Busts of the 21 awardees of Param Veer Chakra have been installed at Param Yoddha Sthal which includes three living awardees Sub Maj (Hony Capt) Bana Singh (Retd), Sub Major Yogendra Singh Yadav and Sub Sanjay Kumar. Officials said the Amar Jawan Jyoti, built in 1972 underneath the India Gate arch in memory of the fallen soldiers of the 1971 war, will remain there but the NWM will be the place to pay tributes to soldiers who sacrificed their lives for the country. Six murals, made by noted sculptor Ram Sutar, depicting famous battles fought by the Army, Air Force and Navy have been put up in a gallery in the Veerta Chakra zone, he added. The proposal to set up a a National War Memorial had been under consideration since early 1970s. A Group of Ministers (GoM) in August 2012 recommended “C” Hexagon of India Gate as the appropriate location for the memorial.